Medieval Henry V Swords for sale are designed after real medieval swords wielded by the King of England. Swords from this popular collection are both authentic in appearance and functional in construction. This sword is modeled after the real sword that was hung over the tomb of King of England Henry V. Henry V was celebrated for his military successes including the Battle of Agincourt. These handmade medieval swords for sale measure 34 ½ inches in all. They have a functional 27 ½ inch, sharpened, forged high carbon spring steel blade. This single-handed medieval sword is intended as a cut and thrust weapon, with a shorter yet full-bodied blade with handsome down-swept quillons on the cross guard. The wheel pommel is peened and the 7 inch handle is manufactured of Makassar ebony wood covered in black leather. 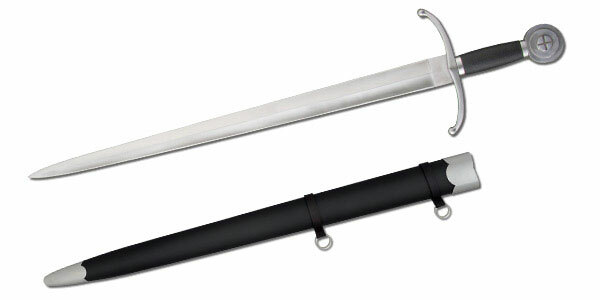 These popular medieval swords include a matching black leather scabbard. These swords are handmade and weigh approximately 2 lbs, 15 ounces. Buy these Medieval Henry V Swords for a battle ready and functional collectible with an exquisite medieval history for $219.99.